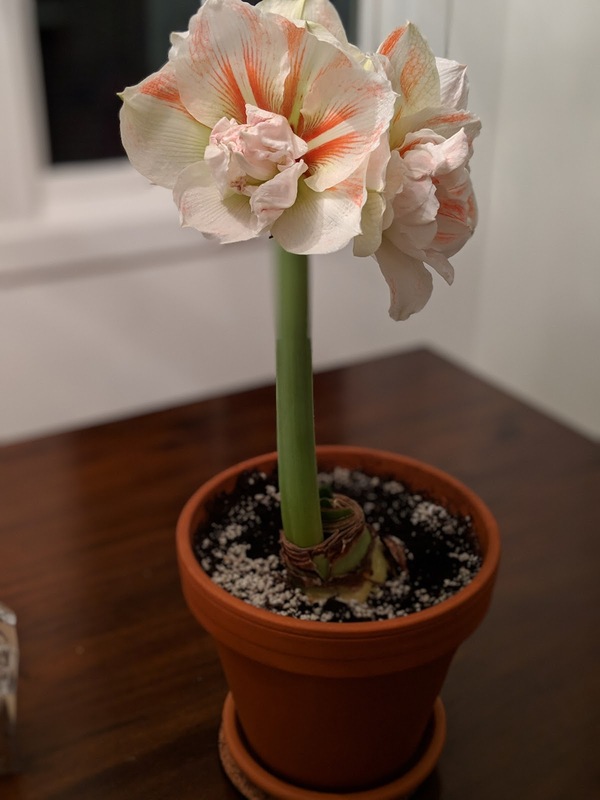 These photos of our Christmas Amaryllis are a few days old, so let's call it mid-January in terms of the timing of the bloom. Look at that beauty! Double blooming variety that is still going strong for us. But, this post isn't about the blooms. It is about the height of the bulb stalk. 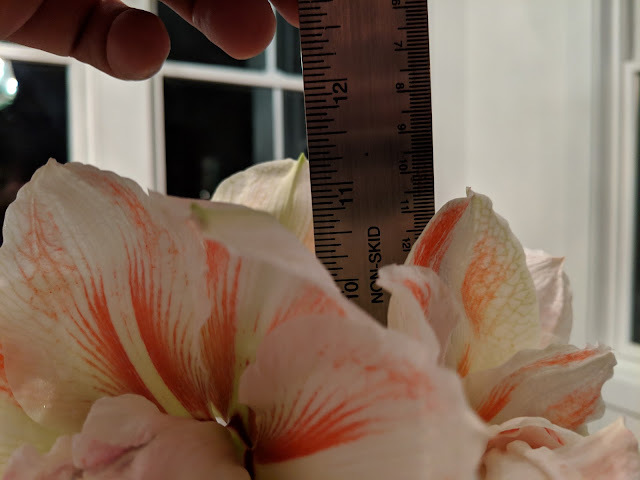 I placed a ruler in the pot and you can see in the photo below: 11.5" tall to the top of the bloom. 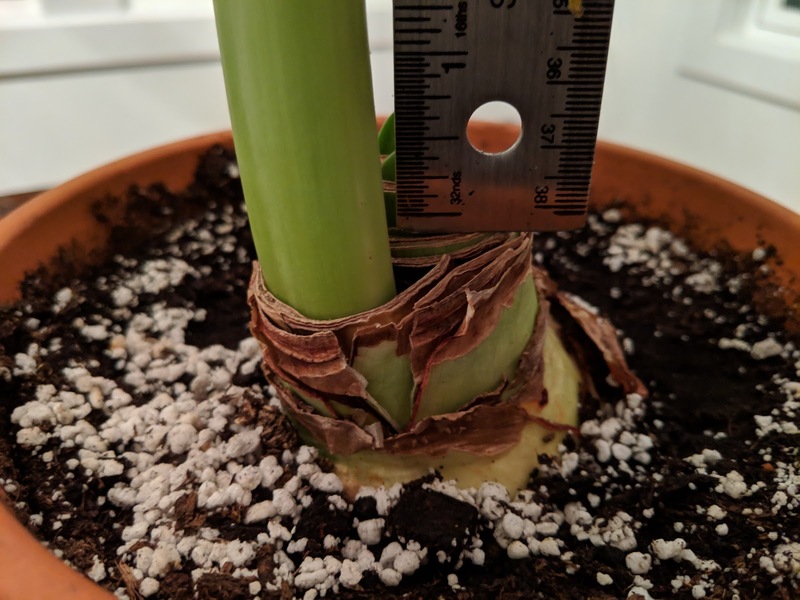 And, just for record-keeping sake, here's a photo (below) of where I placed the bottom of the ruler: at the top of the bulb - NOT at soil level. Amaryllis have a tendency to get long and leggy and with the size of those blooms, from time-to-time, they tip over because the stalk is too lean and long. How does one solve that? By poisoning the bulb. Seriously. I mentioned in my post in December that I'd been giving this bulb an 8% (approximately) blend of vodka and water. In an attempt to keep the stalk from growing too tall. And, guess what? It totally worked! Compare this short, 11.5" growth with what the stalk looked like last year: Maybe 50% taller last year. I'll be using the alcohol method going forward. And so should you.